San Diego, CA, November 10, 2009 -- To develop control systems for “swarms” of miniature robotic ocean explorers that could one day help predict where ocean currents will carry oil spills, engineers at the UC San Diego Jacobs School of Engineering recently won a nearly $1.5 million grant from the National Science Foundation. The engineers are leading the development of the control systems for swarms of small, inexpensive, underwater robotic ocean drifters that researchers at Scripps Institution of Oceanography and the Department of Mechanical and Aerospace Engineering at UC San Diego are designing, building and deploying. Artist rendition of a robot swarm controlled by algorithms developed by engineers at UC San Diego. Image credit: Scripps Institution of Oceanography at UC San Diego. These autonomous underwater explorers will trace the fine details of fundamental oceanographic mechanisms that can be used to determine underwater ocean currents on the order of a few kilometers—currents that are often poorly characterized despite their importance for understanding marine protected areas, algal blooms, oil spills, and the path sewage takes after it is pumped into the ocean. “Maybe there has been an oil spill in the ocean and we want to establish very quickly how and where the spill might move. We are developing the algorithms that will keep a swarm of autonomous underwater explorers (AUEs) coordinated so they can follow the flow of the ocean currents and give us data on the spill as it is moving around,” explained Jorge Cortes, a professor in the Mechanical and Aerospace Engineering Department at the UC San Diego Jacobs School of Engineering and the principal investigator on a new, nearly $1.5 million National Science Foundation grant. In addition to predicting where oil will travel, scientists can use this information on the flow of ocean currents in order to improve their models—and ultimately their understanding—of how ocean currents operate on the scale of kilometers and what this means for ocean life and for determining where marine protected areas should be established. The AUEs must maintain specific distances from one another in order to keep the formations necessary to draw better pictures of ocean currents. “We have developed these kinds of algorithms in the lab, and now we face the task of actually implementing them in the ocean,” said Cortes, who is part of the Cymer Center for Control Systems and Dynamics, housed at the UC San Diego Jacobs School of Engineering. “The information that each robot in the underwater flock has is pretty limited…and this information is very local. From this, we want to induce some sort of global behavior so the whole group moves in one direction—to follows the spill, for example. This is part of the algorithm design. Out of very local information, we need to induce global behavior of the flock of underwater robots,” said Cortes. The project differs from related work on networks of underwater robots in that the robot swarms the UCSD researchers are developing are significantly smaller and less expensive. At the same time, these robot swarms will be far more capable of making use of the information they collect on the fly in order to improve the accuracy of their task at hand. Schematic of a prototype of a swarm robot with buoyancy capabilities. “Together with Jorge Cortes, we are tackling the joint (flow) disturbance estimation and coordinated control problem for the swarms of robots. Such an estimation and coordination problem is especially important when trying to coordinate their motion in the uncertain flow field environment of the ocean,” said Raymond De Callafon, a mechanical and aerospace engineering professor from the UC San Diego Jacobs School of Engineering and a Co-Principal Investigator on the new grant. One of the objectives of the project, according to Cortes, is to create control systems that would enable local agencies to deploy swarms of robots in the ocean quickly to monitor spills and get a clear idea of where ocean currents will carry sewage and other pollutants. 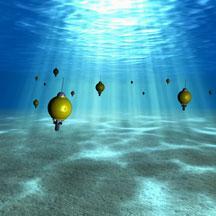 In addition, the swarms of robots will be useful for a wide range of basic ocean research. According to Jules Jaffe and Peter Franks, the two Scripps Institution of Oceanography researchers who are co-principal investigators on the new grant, the robot swarms could aid in science’s development of marine protected areas by following currents for determining critical nursery habitats and for tracking harmful blooms of algae. These Scripps Institution of Oceanography scientists are also leading a related project to further develop the AUEs. This project was recently funded through a $1 million grant, also from the National Science Foundation. The Kepler workflow environment developed by the group of Ilkay Altintas at the San Diego Supercomputer Center at UC San Diego has proven to be an ideal tool to merge both the scientific and (control) engineering workflows associated with this project, explained De Callafon. The NSF grant described in this press release is entitled “Distributed Ocean Monitoring via Integrated Data Analysis of Coordinated Buoyancy Drogues.” Named on the grant are the following five UC San Diego researchers (below) from the Jacobs School of Engineering, the Scripps Institution of Oceanography, and the San Diego Supercomputer Center. Jorge Cortes (Principal Investigator) is a mechanical and aerospace engineering professor from the UC San Diego Jacobs School of Engineering. Ilkay Altintas (Co-Principal Investigator) is the Director for the Scientific Workflow Automation Technologies Lab at the San Diego Supercomputer Center, UC San Diego where she also is the Deputy Coordinator for Research.